The QMTS is a multi-role communications VPN platform designed to simultaneously utilise the wireless data networks of up to four mobile network operators in a single geographic location. Data are transmitted and received across the available carrier networks to a central concentrator server, the QRMS, before being forward to any number of configured client PCs, smartphones, other QMTS devices or to the Internet. Splitting the data across multiple networks leads to higher throughput and greater resilience in the overall link seen by applications and users, while also offering latency control where different link qualities or technologies are present. A QMTS operates an integrated router that manages packet queues internally and transparently to other network equipment. 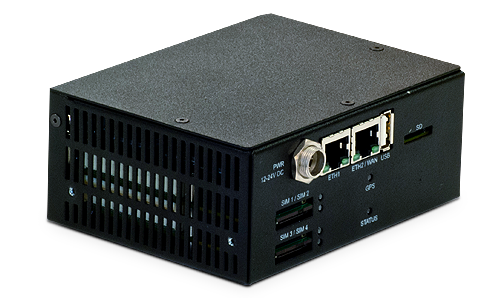 This provides a LAN-like VPN between devices and exposes full IP connectivity between client PCs and equipment while requiring minimal setup or configuration. Encryption and authentication of each individual link secures all traffic within the VPN, while the QRMS server can also apply policies to partition the VPN or block devices as required. Each QMTS contains an integrated 2 port Ethernet switch to which other equipment can be connected, and through use of a USB WiFi dongle, a hotspot for VPN access can be provided. Optionally one Ethernet port can also be configured to use as WAN backhaul, allowing the QMTS to operate the VPN over any public fixed line, leased line or other network link such as satellite. 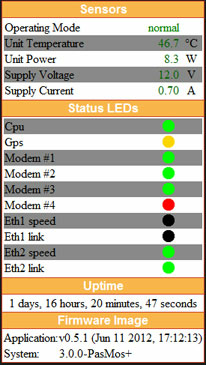 When using WAN backhaul, the wireless modems then add redundancy or extra bandwidth, should the WAN link fail or be insufficient for application traffic. 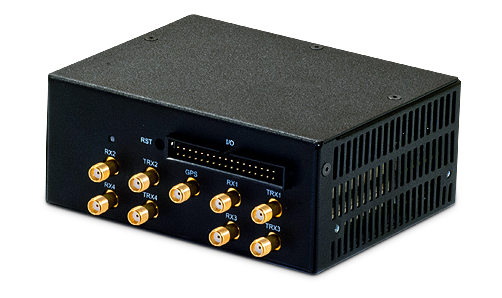 Built-in GPS allows the position of each QMTS to be tracked, while other connectivity such as USB, CANbus and GPIOs allows for specialist integration, control or monitoring of other equipment without needing additional hardware. A simple SDK is available through which applications can be added directly to the QMTS. 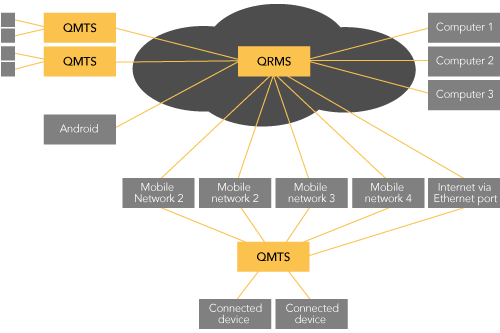 Each QMTS forms multiple connections to the central server, the QRMS, one for each available network. The QMTS operates to maintain and re-establish these links as much as possible while also checking for link liveness and connectivity. Both the QMTS and QRMS cooperate to monitor the quality of each individual link in order to determine the best way in which to segment and forward traffic between each other. Deliberate out-of-order sending of packets can be used by each peer to aggregate bandwidth across links with differing latency, while close modelling of link characteristics allows early retransmission or sending of duplicates under changing network conditions. Transparent interception of TCP connections by the QMTS and QRMS also removes overhead from transmitting TCP headers through the VPN tunnel, while insulating connected devices from any variability in the aggregated connection which may impair normal operation of TCP. Over high latency connections, this TCP interception also ensures that applications and hosts sending data need no modification to utilise the full bandwidth of the link. The entire VPN forms a star topology around the QRMS, which ensures routing policies and network partitions are respected, while also allowing administrative functions such as software updates, monitoring and alarm reporting to be centralised. The QRMS Itself may either be installed and hosted as an application in its own right, or access to existing QRMS platforms can be provided for evaluation and use. Backhaul via WAN port Ethernet only e.g. cable modem, ADSL router, corporate LAN, BGAN etc. Your IP address, [34.230.84.215], has been recorded and all activity on this system is actively monitored. Under US Federal Law (18 U.S.C. 1030), United Kingdom Law (Computer Misuse Act 1990) and other international law it is a criminal offence to access or attempt to access this computer system without prior written authorisation from cellXion ltd. Any unauthorised attempt to access this system will be reported to the appropriate authorities and prosecuted to the full extent of the law. Your IP address has been recorded and all activity on this system is actively monitored. Under US Federal Law (18 U.S.C. 1030), United Kingdom Law (Computer Misuse Act 1990) and other international law it is a criminal offence to access or attempt to access this computer system without prior written authorisation from cellXion ltd. Any unauthorised attempt to access this system will be reported to the appropriate authorities and prosecuted to the full extent of the law.